"The pacing of 'Pecking Order', always the critical thing in any documentary, is flawless, and the editor and the cinematographer are the same man, the very talented Mike Kelland"
Radio New Zealand - At the Movies. 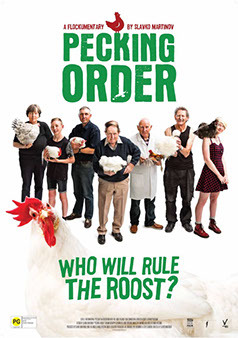 'Pecking Order' is a feature documentary directed by Slavko Martinov, made in conjunction with the New Zealand Film Commission, distributed by Vendetta in Australasia and with sales through Seville International. It won the Vista Film Marketing prize in 2016 thanks to Slavko's excellent pitch. The film World Premiered at Hot Docs, the Canadian International Documentary Festival. It then premiered locally at the New Zealand International Film Festival on May 9th 2017. New Zealand cinema release followed with the film making over $500,000 at the box office, staying in the top ten for 4 weeks. International Film Festival in August, with Adelaide and Perth Film Festivals and cinema release following that. Additional cinematography on the film by Julian Vares, James Ellis, Richard Lord, Slavko Martinov and Whare Pullan. 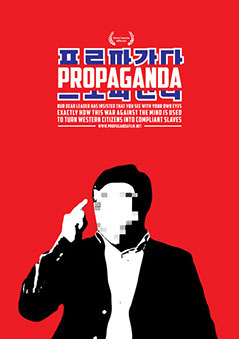 Mike edited and co-produced the feature film ‘Propaganda’ in 2012, together with director Slavko Martinov. Hailed as “genius” by Michael Moore, it was awarded the Founders Grand Prize for ‘Best Film’ at his 2013 Traverse City Film Festival. It topped Indiewire’s top 10 films to watch out for at IDFA 2012, where it had its world premiere. Before this it had been anonymously released on YouTube, gaining over 3 million channel views. This was followed by The Independent declaring it "The real viral hit of 2012" and Films for Action rating it their Number One film for 2012. In 2013, it was awarded a Special Mention at the Biografilm Festival in Italy, and went on to screen at festivals including Raindance and CPH:DOX. INZONE Edit - various promotional videos for the Inzone Careers Bus and Kiosks since 2008. Videos edited include ASB, Massey University, University of Canterbury, MITO, HITO, EXITO, ESITO, DHB's, Queenstown Resort College and many more - Belmont Productions.